Liked the location and nearby parking, did not like the outside noise at night But the most upsettjng was the filthy filthy filthy stairwells at the parking structure across the street. I could not believe a upscale casino like the Grand would expose their customers to something that. Clean rooms, pretty decent service. Get ready for a really bad food in the restaurant. And most likely minor food poisoning... And a kicker: few if any alternatives around. I love the location not right in the center of everything. The drink specials are awesome! Stayed here twice, will keep doing so! The staff was very friendly and accommodating. The rooms were clean. The valets were fantastic. All around great experience. Bed uncomfortable. Sink clogged up. Very loud. Did not know theirs in advance. Downtown Grand was very nice for a very reasonable price, and the location is great if you want to be in the downtown Fremont Street area. Restaurant was good (Freedom Beats). Room was not ready upon arrival but they accommodated us the next day. 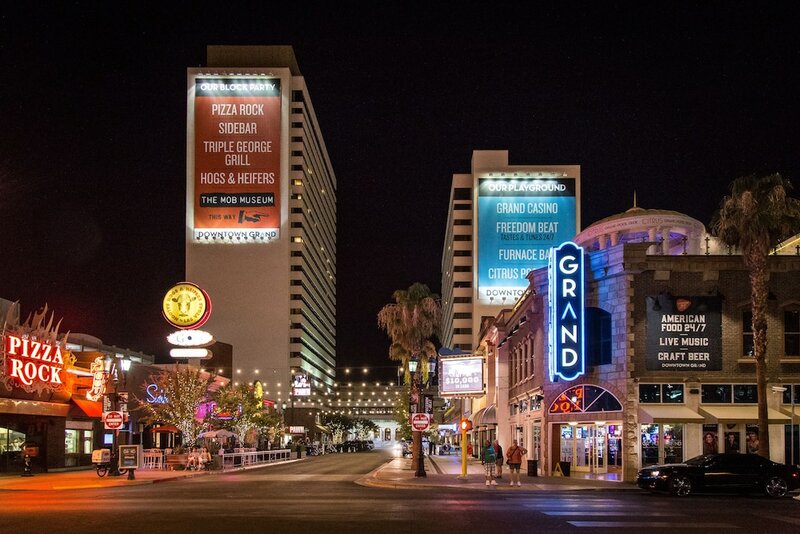 Located in Downtown Las Vegas, Downtown Grand Las Vegas is adjacent to Mob Museum and within a 5-minute walk of other popular sights like Golden Nugget Casino. This 3.5-star hotel has 629 rooms and welcomes guests with 4 restaurants, a casino, and an outdoor pool. There are ample dining options with 4 onsite restaurants, including Freedom Beat, which specializes in American cuisine. Satisfy your hunger without leaving your room with 24-hour room service, or quench your thirst with a beverage at the bar/lounge or coffee shop/café. Cooked-to-order breakfast is offered for a fee each morning from 6 AM to 11 AM. A plasma TV comes with cable channels and pay movies, and guests can stay connected with free WiFi and wired Internet. The pillowtop bed provides a full night's sleep and the bathroom offers hair dryers. Other standard amenities include free local calls, free bottled water, and a safe. At Downtown Grand Las Vegas, guests enjoy a casino, an outdoor pool, and a 24-hour fitness center. Valet parking is offered for USD 8.00 per night. A multilingual staff is on hand to assist with dry cleaning/laundry, luggage storage, and concierge services. Additional amenities include a rooftop terrace, free WiFi in public areas, and a business center. Thank you for your feedback and thank you for choosing Downtown Grand! Cooked-to-order breakfast is served daily from 6 AM to 11 AM for a fee. Freedom Beat - Restaurant and bar specializing in American cuisine and serving breakfast, lunch, and dinner. Kid's menu available. Open 24 hours. Pizza Rock - Restaurant and bar specializing in Italian cuisine and serving brunch, lunch, and dinner. Triple George Grill - Steakhouse and bar specializing in American cuisine and serving lunch and dinner. Recreation features at Downtown Grand Las Vegas include an outdoor pool and a 24-hour fitness center. Driving? This property offers valet parking (fees apply).